After running the command bastille, you will see a wizard like window interface which will guide you through the different steps of hardening your system. These steps involve setting file permissions, disabling FTP, Firewall, Printing, disabling unnecesary services and accounts. Not only this is a very good tutorial on Linux security, but also a tool for hardening your system. Be aware that your security obligations do not end here, this is just a very good first step. Then monitor your server console. You will see your server stop and show you a command line prompt where you will be able to debug your program. You will find further information in the Python documentation website. Then, you can either click on the “Compute Standard Price” button or check it in the product bill of materials (a product can have more than one bill of materials). 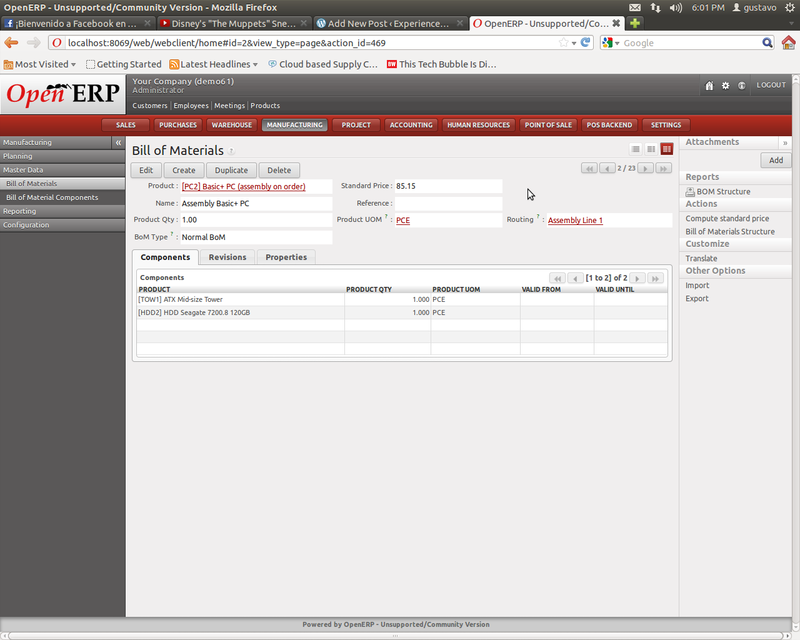 In the latter, you can find the product information on the Bill of Materials form. You can calculate the standard price by clicking on the “Compute Standard Price” wizard on the right of the BoM form. How is this cost calculated? This is the interesting part, it takes into account the product cost of each product, plus the hours and cycle costs of every workcenter that is involved in its routing. A very useful module. install and learn, and in minutes I had it running in my system. After reading the documentation, which took me minutes, I was able to configure its configuration file, restart the daemon and have openerp–server and openerp-web running automatically in my computer. Why I like it? Because this tool allows me to manage my process and it does not take me long to do that. It can also be controlled by other Python programs, which might be handy in some projects. 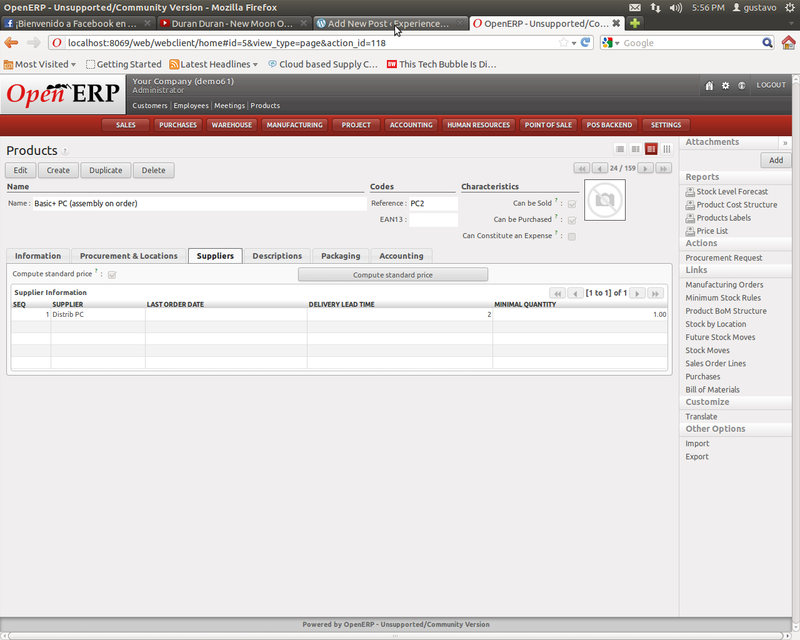 In OpenERP, as in any other ERP or system, you need to perform certain tasks regularly. Tasks such as performing a backup, calculating ABC categories, running the MRP planner, etc. How do you get this done in OpenERP? 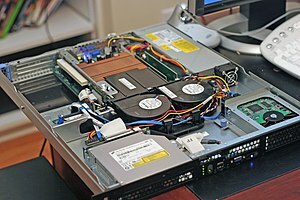 It’s quite easy and you don’t need your server administrator to get this done. 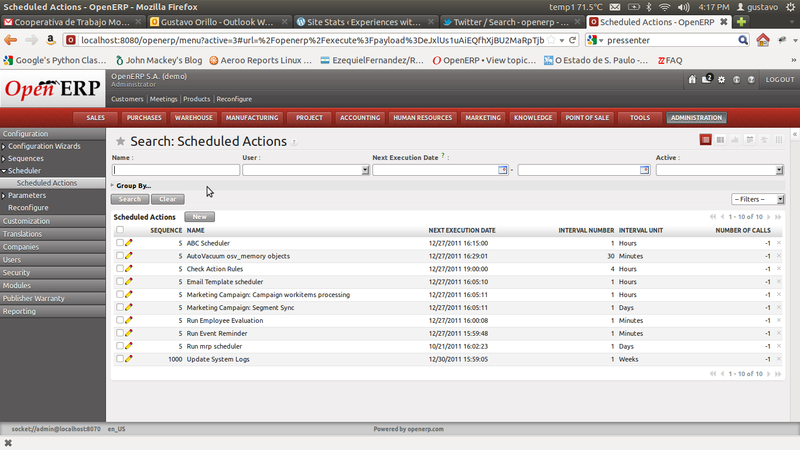 Scheduling tasks in OpenERP is done via the Scheduled Actions in the Administration > Configuration > Scheduler menu. In this section, you will be able to create new actions. So click on the New button in the view. After clicking New you will see a form that allows you to enter information in two tabs, an Information tab and a Technical tab. In the first tab you will be able to enter the name of the action, whether it is active or not, and how regularly it is executed. In the technical tab, and you might need a programmer help for this, you have to enter the name of the object that will run the action; along with the function to schedule and its arguments. This is the tricky part of scheduling an action, since you need to get into the details of how the system works and you will need your programmer to dig into the object code. But it is worth it, once you understand how this works, you will be able to get many things accomplished. 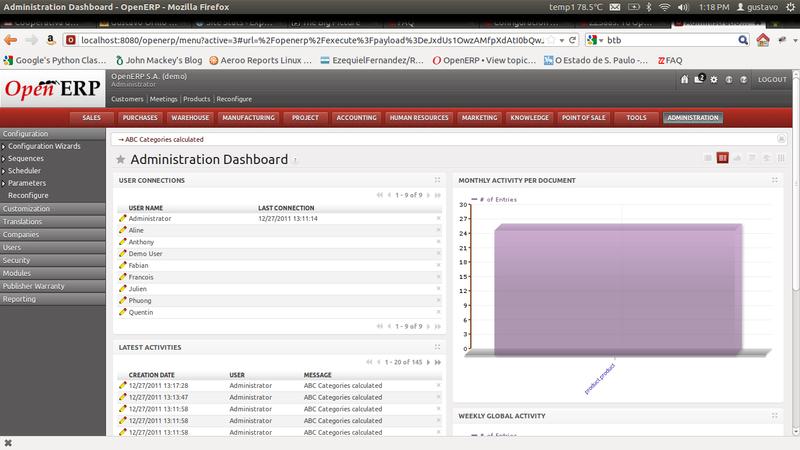 I always wondered how to, in the OpenERP web client, show those informational messages in the top of the web client. Messages such as ‘PO/00001 created’. They are very informational for users. Well… reading a presentation on the differences between OpenERP v5 and v6 I found that one of the additions was the self.log function which, as its name implies, logs a message to the audit logs (which can be accessed at Administration/Audit/Logs) and the Administration Dashboard (which can be accessed at Administration/Reporting/Dashboard/Administration Dashboard). ABC analysis is very well covered in this Wikipedia article. So no point of talking about it again here. 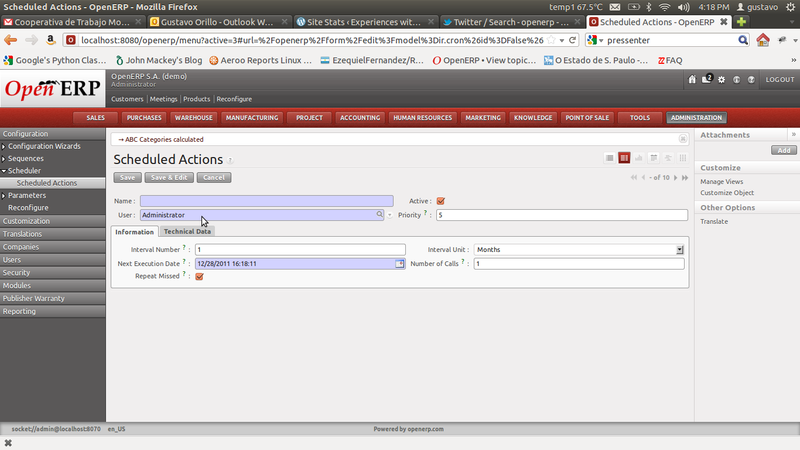 Thing is, how do you implement it in OpenERP. Truth is, it is not a great deal. You only need to pull the sale order lines for the past six months (for example, could be a year as well or the period under analysis), then by product summarize its sales (not taking into account any discounts) and then divide the sales number by the total sales amount, in order to figure out the product ABC Category. If you are an experienced programmer or data analyst, you can do this in minutes. If not, does not take long to figure out how to query the OpenERP database. Thing is, this information is not integrated into OpenERP yet (and it makes sense, since you do not need this information for the MRP application. It’s nice to have it, but it is not critical). So I created a module that regularly categorizes OpenERP products according to its sales. I have not finished it yet and I need to upload it to LaunchPad, but I think I will do it this week. What does this module do? Allows you to create ABC categories (you can have as many as you want) where you define the category and its range. Then regularly (as an scheduler action) categorizes the products taking into account their sales lines. Then updates the product abc_category field (created previously by the module installer). I still need to polish the module and add a couple of files, such as a XML file with initial information (specially for the scheduler and categories). As soon as I get it done, I will upload it to LaunchPad and publish it.